Q: How do you feel about winning Victoria's Multicultural Award for Excellence? A: We are both honoured and humbled by this award. The Victorian Multicultural Marketing Award acknowledges our achievements and services as a publisher in promoting cultural diversity in Australia and overseas. Here at eBook Dynasty, we translate, publish and promote English-language authors of diverse ethnic and cultural backgrounds to the Chinese World, as digital and print books in both Simplified Chinese and Traditional Chinese. We also help emerging and established Chinese-language authors worldwide to promote their writings, with professional editorial standards, regardless of their political, ethnic, cultural, religious and/or ideological backgrounds. Having gotten this meaningful business venture up and running, with hard work over the past three years, to now have our efforts recognised in this way is extremely gratifying. Q: What are you most proud of with regards to eBook Dynasty? A: We have been working extremely hard over the past three years to build a bridge between the English and Chinese Worlds. We reach out to traditionally and independently published English-language authors, as well as literary agencies and publishers, and help them to translate and promote their titles to Chinese readers across the globe. We also encourage emerging and established Chinese-language authors to cross all political, ethnic, cultural, religious and/or ideological borders, to promote diversity and freedom in literature, without fear of censorship, discrimination and state-sanctioned persecution. We are very proud of the fact that this hard work and pursuit of excellence is increasingly being recognised by authors and readers worldwide. Q: What do family and friends think about you winning an Award? A: Our family and friends are immensely proud of us winning a Victoria's Multicultural Award for Excellence. It is an affirmation of our day-to-day life within a multicultural society, where people of all ethnic, cultural and professional backgrounds co-exist in harmony and mutual respect. We are always learning from each other, in our own microcosm of Australian society at large. 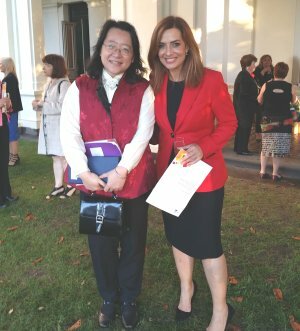 About the Photo: Christine Sun (left), manager of eBook Dynasty, with Helen Kapalos (right), Chairperson of the Victorian Multicultural Commission, at Government House, December 3, 2015. Photo credit: eBook Dynasty.